The demolition of Ho Chi Minh City’s iconic Tax Trade Centre started on Wednesday morning with the building set to be replaced by a multi-functional skyscraper. The 130 year-old Saigon Tax Trade Center, one of the most symbolic buildings in the city, will give way to the Satra -Tax Plaza, designed as a shopping center, hotel, and office building. Under the direction of the municipal People’s Committee, several sections of the old building will be preserved and reused once construction of the new skyscraper is completed, the Saigon Trading Group (SATRA), developer of the project, told the press on Tuesday. 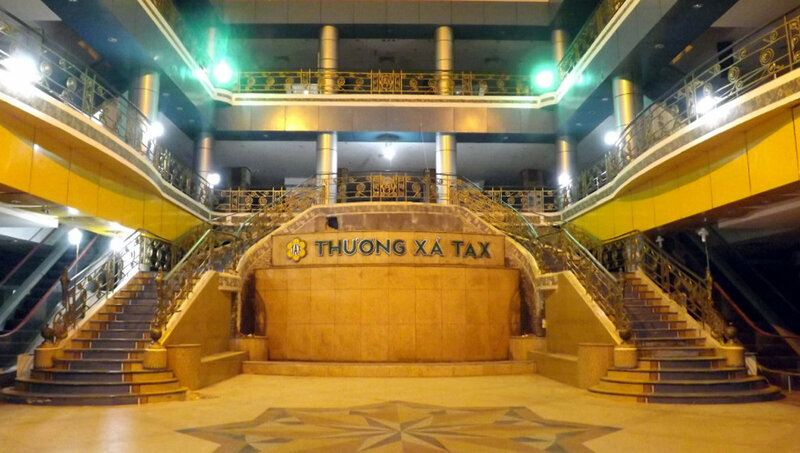 According to Doan Hoai Minh, deputy general director of SATRA, the main hall, the staircase to the first floor, and the mosaic tiles will all be saved. Several parts of the building’s exterior will also remain, Minh continued. The restoration and demolition process was carefully assessed by domestic and international experts and architects, the deputy general director stated, adding that one of four proposed methods was eventually selected. One of the most challenging tasks is removing the mosaic tiles without damaging them, he said, stating that the material is rare and difficult to replace. Following thorough research and careful execution however, the developer has been able to minimize the number of tiles damaged during the removal, Minh elaborated. He confirmed that the entire process had begun in secret in late June and completed on September 15, to avoid pressure from the public. “Broken tiles during the removal accounted for less than 15 percent of the total, which was lower than estimated,” Minh said. With regard to the maintenance process, the deputy general director pledged that the tiles would be kept in the best possible condition and ready to be added to the new building upon its completion three years from now. He also refused to reveal where the material was being preserved. According to SATRA, several architectural aspects and designs of the Saigon Tax Trade Centre will be seen in the first few floors of the new 40-story skyscraper. The mosaic tiles are being carefully removed in these file photos. Founded in 1880, Les Grands Magazins Charner (GMC), the original name of the Saigon Tax Trade Center, along with other French architecture including that of Ben Thanh Market, Notre Dame Cathedral, Saigon Central Post Office, and Hôtel de Ville de Saïgon (now the Ho Chi Minh City People's Committee headquarters), were all considered part of the former glory of Saigon, now Ho Chi Minh City. Following a series of name changes, the building was given its final name on January 19, 1998. In August, 2014, the developer of the building announced the immediate shut down of the tax trade center, resulting in traders struggling to find new homes for their businesses. Given such short notice, many merchants offered high discounts on their goods before the building was put out of service. Local residents have expressed their nostalgia for the 130-year-old building, with many rushing to the center to take final photos prior to its demolition.